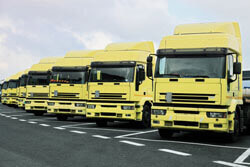 Finding competitively priced haulage fleet insurance for your vehicles can be a time consuming task. As an experienced insurance broker, Goldcrest Insurance has access to all the leading insurers including Lloyds and specialist schemes allowing us to source the cheapest quote to match your needs. Currently we help many haulage companies save both time and money by getting them the best available rates through our in depth knowledge and exclusive schemes only available to us. With a growing difficult economy; rising fuel prices and escalating insurance costs this means many hauliers margins are under extreme pressure. Reducing your overall premiums can help manage the rises in cost across your business. At Goldcrest, we tender the market and negotiate on your behalf; and do everything possible to assist your business by reducing your insurance premiums which in turn, will no doubt represent a significant percentage of your overheads. ‘Any driver’ policies can maximise your business and vehicle efficiency, often for only a small uplift on your premium but allowing you to maximise efficiency and flexibility. What’s more, our account handlers will offer you free haulage fleet management services throughout the life of your policy – maximising your business effectiveness, saving costs and freeing up your time to concentrate on your core business. Remember, our team deal with Hauliers just like yours every day and are specialists in the fleet insurance market – we know where the best rates are available at any given time, and ensure your policy has all the protection and benefits your business requires. If you are a haulage company with over 4 vehicles call Goldcrest today on 0208 440 7400 for a free quote, we will search the current market to get you a comprehensive policy for an affordable price.